When my article on field curvature was published a while ago, where I talked about how one could do a quick analysis of lens MTF data and determine if it exhibits any field curvature, some of our readers expressed interest in understanding how to read MTF charts. Since we talk quite a bit about lens performance and MTF data here at Photography Life, I decided to write a detailed article on the subject and do my best to thoroughly explain everything related to MTF curves, charts and all the verbiage that comes with them. Because many modern lens manufacturers publish MTF data to show the potential performance of their newly released lenses, it can be quite useful to know how to interpret the provided data – whether you are researching lenses, comparing them, or evaluating their performance before making a purchasing decision. At first, MTF charts seem to look overly complex, but once you understand the underlying basics, you will be able to quickly assess the data and draw important conclusions. The image on the left clearly shows very low contrast (a rather exaggerated example for illustration purposes), while resolution remains relatively high. You can see some feather details on the heron, but lack of contrast in the image makes many colors and shades indistinguishable. In short, the lens provides enough resolution, but not enough contrast. The middle image has plenty of contrast, however, lack of resolution makes the image appear blurry. The image on the right, however, has both high contrast and high resolution, which makes us perceive it as the sharpest and the most detailed of the three. To be a little more technically correct, I am going to rephrase the above. You would never say something like “that photo has high resolution”, but rather something like “that photo is sharp”. Now we are going to dig a step further into the definition of sharpness and its perception. No matter how you look at it, sharpness is always subjective. One image could appear sharp to one person, while appearing blurry / soft to another. That’s why there are so many never-ending debates on why one lens is better than another, or why manufacturer A is better than manufacturer B. The fact of the matter is, people perceive sharpness differently. If I say that the Nikon 200-400mm f/4G lens is soft with the 2x teleconverter due to significant loss of sharpness, there will always be someone that will argue otherwise. Not because they have a better copy of the lens or the teleconverter, or better technique, but because their perception of sharpness is very different from mine. What I define as “unacceptable” could be “reasonably sharp” for someone else. This has happened to me recently, when one of our readers complained about my comment and sent me a “sharp” photo. After I opened the image, I could clearly see that it was far from being sharp and it even lacked contrast, but the sender apparently did not think so. For many photographers, reasonable sharpness with enough detail to be able to downsample and sharpen the image for the web is more than adequate. Whereas for me and many others, that’s really not an option, because we want to sell high resolution prints, not tiny images that will only be shown on the Internet. And many of us that photograph little birds often have to crop heavily, which shows all the deficiencies at pixel level. If you factor in other variables such as sensor size, lens quality, in-camera sharpening, downsampling and post-processing, you will realize how many different factors can potentially influence the perceived sharpness of an image. The first crop on the top of the image shows low acutance and high resolution. The lens was able to resolve plenty of detail, but the transition between the edges is not sudden, which makes the image appear a little soft. The second image in the middle lacks resolution, but has high acutance (edge transitions), because an excessive amount of sharpening was applied to make the image look sharp. As you can see, full details could not be fully recovered and hence some of the features are grossly over-exaggerated. The last image has a high amount of both acutance and resolution, which makes us perceive it as the sharpest and the most detailed of the three. This example shows that our perception of sharpness is highly dependent on both resolution and acutance. Now that you understand how important contrast, resolution and acutance are in yielding sharp images, let’s take this a step further and talk about measuring and quantifying lens performance. Since perceived sharpness is always subjective, it is impossible to quantify lens performance by merely looking at details in an image. As I have pointed out above, too many variables could influence our perception. Because of this, manufacturers came up with objective methods to measure lens performance in controlled lab environments or approximate the potential performance of a lens through computer simulations (more on simulated MTF data below) without relying on human perception. This commonly accepted measure of lens performance is called MTF, which stands for “Modulation Transfer Function”. Since no lens is perfect in transmitting light, MTF can be quite useful in quantifying loss of both contrast and resolution. Acutance does not apply here, because we are not talking about our perceived sharpness, but rather strictly about the ability of a lens to resolve high amount of detail with maximum contrast. Most MTF graphs you see today are made with specialized computer software that measures or simulates lens performance and outputs the results. On our site, for example, we use Imatest software to measure lens performance. Hence, while MTF charts can be useful for evaluating some data, they do not provide the complete picture of optical performance of a lens. Most manufacturers came to a conclusion that providing MTF data is sufficient and the above deficiencies were never incorporated into specific lens tests or additional charts. It is also important to note that performance between short and long focal lengths in zoom lenses is also typically not provided. For example, for a 70-200mm lens, manufacturers will provide MTF data only for the shortest and the longest focal lengths of 70mm and 200mm, but nothing in between. That’s one of the reasons why we (and many other sites) focus on the above optical problems and data deficiencies when reviewing lenses. Those red dots are fine line patterns that are analyzed at a certain position from the center of the image frame, or the 24x36mm full-frame FX sensor in this case. Measurements are taken at 5mm, 10mm, 15mm and 20mm from the center of the sensor. 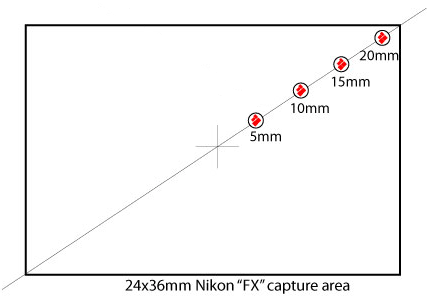 On APS-C size sensors, Nikon takes measurements at slightly different intervals – 3mm, 6mm, 9mm and 12mm, because the sensor size is obviously much smaller than full-frame. As you can see, thick and thinner red lines are placed at different intervals to measure contrast and resolution, respectively. Line groups are strategically placed at two different angles – one angled from the center of the frame outwards, parallel to the radius of the lens and pointed towards the center (also known as “Sagittal”) and the other angled in the opposite direction (also known as “Meridonial”). This is done for a reason – due to lens aberrations, some lenses are very good in resolving details pointed in one direction, but no so good in resolving details pointed at another direction. For MTF measurements, both Sagittal and Meridonial data is provided, which helps to easily identify lenses that exhibit astigmatism (more on astigmatism below). The lines on the very left are easily distinguishable – that’s what a perfect lens with no optical flaws would transmit. Since such lens does not exist, there will always be some amount of blur visible. As the performance of a lens gets worse, especially towards the corner, the measurement system might no longer distinguish blacks from whites, which basically means total loss of resolution. If you take the much thicker 10 lines/mm group and repeat the same exercise, it is very unlikely that the blacks will converge with the whites to gray. Even some of the worst modern lenses have more than enough contrast for 10 lines/mm. Only if one were to de-focus the lens, those patterns might become indistinguishable. Now that you know how line groups are placed and measured, it is now time to get to know how to read typical MTF charts. Please note that all manufacturers have their own methodology on how they display MTF data and what data they actually plot, so a single “howto” guide is not sufficient to cover it all. That’s why I separated this part by manufacturer. Before we jump to specifics, let’s go over the typical layout of an MTF chart. Before we get into curves, you first need to understand what the X and Y axes are for. 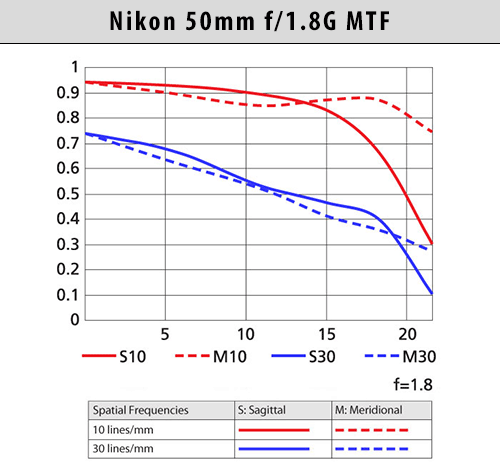 Above is a simplified Nikon MTF graph with no data plotted on it. 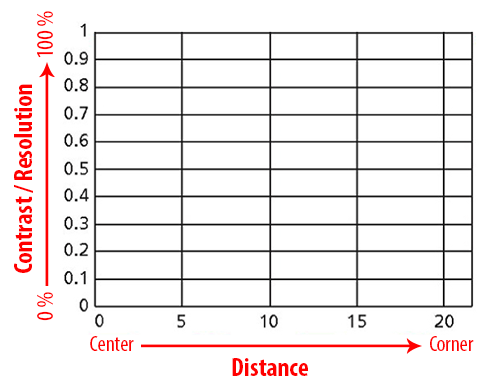 The X axis (horizontal) shows the distance from the center of the frame towards the corners. The value 0 indicates dead center, while 5, 10, 15 and 20 represent the distance in mm from the center of a full-frame sensor that I talked about earlier. Typically, most manufacturers will have the same intervals for full-frame lenses. If the above chart was for a smaller Nikon APS-C size sensor, the numbers would be 0, 3, 6, 9 and 12. Interval steps for APS-C sensors can be different across manufacturers – Canon, for example, uses 0, 5, 10 and 13 for APS-C lenses. 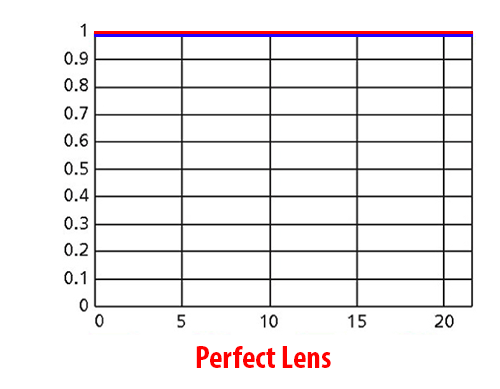 The Y axis (vertical) shows the amount of light that a lens is capable of transmitting. Instead of plotting percentages (0% to 100%) that indicate the amount of light that is transmitted, the data is simplified from 0 (0%) to 1 (100%). Each horizontal line in the chart is plotted in 0.1 (10%) increments such as 0, 0.1, 0.2, etc. If we examine the red curve, which indicates the contrast of the lens, we can see that the lens has pretty high contrast in the center, which then gradually decreases towards the middle of the frame, then drops sharply right in the middle (10mm mark), then picks up between mid-frame and corners, then drops sharply again towards the extreme corners. Resolution starts fairly strong in the center, then gradually falls towards the middle of the frame, then picks up a little between middle and corners, then drops sharply in the corners. What this all means, is that at this particular aperture, if you took a picture of a flat target, you would see pretty impressive center performance that gradually drops towards the middle and then sharply at the corners. The “wavy” nature of the curve indicates the presence of curvature of field, as explained in my article on field curvature. You might be wondering about what numbers in the vertical Y axis can be considered “good” or “bad” for both contrast and resolution. Generally, contrast will typically be higher than resolution in MTF charts, so anything higher than 0.9 indicates excellent contrast, between 0.7 and 0.9 is generally very good, between 0.5 and 0.7 is average and anything below 0.5 is soft / bad. For resolution, these figures are obviously going to be a little lower, especially for wide open performance. But this is my subjective opinion – the ranges for what is considered to be excellent or average will probably vary from person to person. If you compare the above chart to the previous one, you should now be able to tell that this lens has better overall performance than the previous one. Both contrast (red lines) and resolution (blue lines) are higher and the performance of both is very good all the way to the corners. At the extreme corners, there is a sharp decline of resolution, but the contrast stays very high. Now what’s important to note here, is that we also have dotted lines that run close to the to the solid lines, so if you look at the chart legend, you will see that the two types of lines indicate Sagittal (solid line) and Meridional (dotted line) groups that we talked about before. So in this case, because the solid lines and dotted lines are fairly close to each other in the center, the lens exhibits almost no astigmatism. The lines separate a little more from the mid-frame, so we should expect to see slightly more astigmatism in that area of the frame. Some manufacturers claim that the closeness of Sagittal and Meridional lines indicates good quality of blur or “bokeh“. I would not try to make quick conclusions of bokeh quality by looking at MTF charts alone, because there are many other factors that affect the quality of blur, including: number of diaphragm blades, aperture, quality of optical elements, etc. Personally, I only look at the separation of solid and dotted lines to see if the lens suffers from heavy astigmatism and lateral chromatic aberration. The strong separation of Sagittal and Meridonial lines is always an indication that the lens is badly corrected for astigmatism and lateral optical aberrations. For bokeh tests, I perform completely different tests in a controlled environment (which you can see in many of my lens reviews). Lastly, because the lens does not curve up and down throughout the frame, we can conclude that this particular lens does not suffer from wavy field curvature issues like in the “typical lens” example. Let’s now go over specific examples on how to read and interpret manufacturer-specific MTF data. What Nikon MTF charts do not provide, unfortunately, is stopped down performance of lenses at f/8 (like Canon and other manufacturers do). MTF data is also limited for zoom lenses, because only the shortest and the longest focal lengths are provided. In the case of superzoom lenses like Nikon 18-300mm, it basically means that you can only look at the performance at 18mm and 300mm, but nothing in between. As you can see, the Nikon 50mm f/1.8G has pretty good contrast for both Sagittal and Meridonal lines in the center and middle of the frame at the maximum aperture of f/1.8. Resolution is very good in the center and it gradually falls off towards the extreme corners, where it is pretty weak. There is almost no sign of wavy field curvature, because we do not see sudden spikes in both curves. The Sagittal and Meridonal lines do separate at the extreme corners for the thicker 10 lines/mm spatial frequency (contrast), but not so much for the 30 lines/mm (resolution), which means that astigmatism and lateral chromatic aberration is less pronounced on fine patterns and should not be an issue overall. This is the type of summary you can make from just looking at the above MTF chart. At the same time, as I have already pointed out earlier, Nikon’s MTF is pretty limiting, since it does not show the stopped down performance of the lens. The MTF graph looks messier than Nikon’s, but it actually provides more useful information. The thick lines represent contrast measurements (10 lines/mm), while the thin lines represent resolution (30 lines/mm). The black lines show performance at maximum aperture, while the blue lines show performance at f/8. The solid lines represent Sagittal measurements, while dotted lines represent Meridonial measurements. Taking all this into consideration, let’s take a look at the lens performance. First, we will take a look at the black lines, which represent contrast and resolution of the lens at the maximum aperture of f/1.8. Looks like the contrast of the lens is very good in the center, which obviously gets worse towards the extreme corners. Resolution is pretty average and also diminishes towards the corners. Both Sagittal and Meridonial lines are fairly close in the center, which is good news, but separate largely at the corners, which translates to astigmatism and lateral chromatic aberration. There is a little bit of field curvature, but it is more or less under control. Stopped down to f/8, the performance of the lens improves dramatically. Contrast is excellent from the center to the extreme corners, while resolution is also excellent, although there is some amount of wavy field curvature present. Meridonial resolution stays pretty flat, but Sagittal sharply drops at the 17mm mark. So signs of astigmatism and lateral chromatic aberration are still there, but only in the extreme corners. Because both large and small aperture performance is provided, you could also potentially evaluate serious focus shift problems. If the sharpness moves away from the center when the lens is stopped down, it typically means that the lens suffers from focus shift issues. Looking at the maximum aperture data, you might draw a conclusion that the Canon EF 50mm f/1.8 II is worse than the Nikon 50mm f/1.8G. I would not rush to make that assumption, because MTF data cannot be compared across different manufacturers. This is due to the fact that optical measurements, as well as MTF criteria are different between Nikon and Canon. 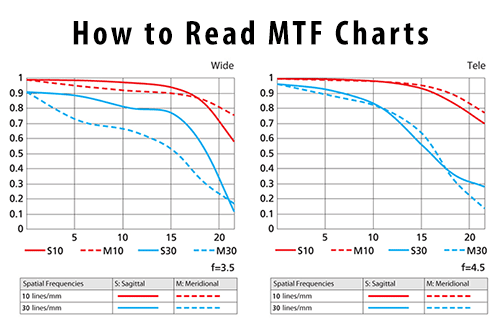 One major difference between Zeiss and Nikon/Canon MTF charts, is that Zeiss provides MTF data at three different frequencies – 10, 20 and 40 lines/mm. 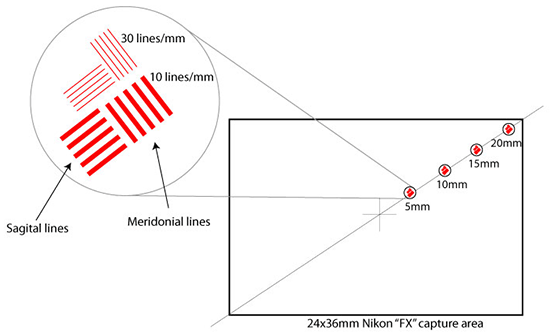 The 40 lines/mm is a very fine measure that is obviously higher than 30 lines/mm from Nikon/Canon. In addition, Zeiss provides both large aperture and stopped down MTF performance, which means that the amount of data provided in MTF charts is higher. Because each frequency is displayed with both Sagittal and Meridonial values, it means that there is a total of 6 curves per chart. Mixing maximum and stopped down performance into a single chart would yield 12 total curves, which would clutter the chart and make it unreadable. Because of this, Zeiss typically keeps performance at different apertures in separate MTF charts. In addition, Zeiss chooses not to normalize percentage figures for the vertical X axis to 0-1, but uses percentages instead. The MTF chart on the left represents performance at maximum aperture of f/1.4, while the chart on the right shows stopped down performance at f/4. 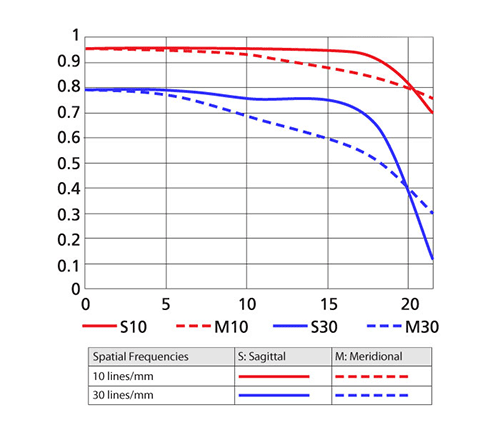 MTF data is not colored or bolded for the different frequencies, so you can always assume that the first 10 lines/mm curve that is used for measuring contrast is on the top, followed by the 20 lines/mm curve and the 40 lines/mm curve for resolution is always on the bottom. 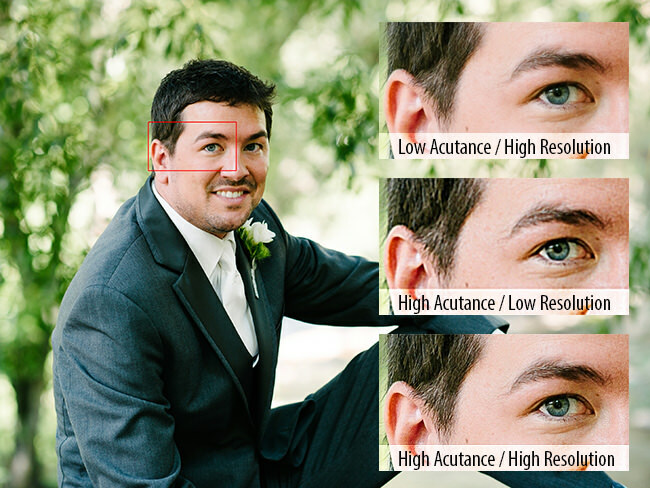 Looking at the above chart at the maximum aperture of f/1.4, we can make the following assumptions. The contrast of the lens is excellent in the center, which steadily diminishes towards the extreme corners. Resolution is very uniform, with practically no signs of wavy field curvature until it gets to the 17mm mark – that’s where resolution drops. The Sagittal and Meridonial lines are pretty close together at all frequencies right up to middle of the frame. Starting from the middle, Meridonial measurements drop, which indicates that there is some astigmatism and lateral chromatic aberrations visible towards the borders of the frame. Stopped down to f/4, both contrast and resolution improve dramatically. Contrast is excellent throughout the frame. Resolution starts out very strong in the center and increases in sharpness towards the middle of the frame, which is a sign of focus shift. There is a little bit of wavy field curvature visible at the very fine frequencies. Both Sagittal and Meridonial lines run almost in parallel and gradually fall off together, which indicates that astigmatism and lateral chromatic aberrations are practically absent (only visible in the corners at 40 lines/mm). As you can see, MTF data is presented differently between the three brands we looked at. If you looked at MTF data from other manufacturers, they could have more or less frequencies in their MTF charts. Leica, for example, provides the most amount of data with 5, 10, 20 and 40 lines/mm measurements. When manufacturers test lenses, they typically measure the performance of the lens itself, without other components like the camera. Because camera technology changes every year and sensors obviously also change in resolution, it would be foolish for manufacturers to test lenses on a particular camera body. Imagine what an MTF chart would look like from 10 years ago tested on the 6 MP Nikon D70, versus one tested on the 36 MP Nikon D800E. Because of this, real MTF tests by manufacturers are always carried out using expensive optical bench setups. Different frequencies are measured with precision instruments in order to produce MTF data. Therefore, one should understand that any MTF results that involve both the lens and the camera will always be tied to that particular camera body. If I test a lens attached to a Nikon D800E body using Imatest today, I cannot provide comparable data that is captured with a different camera tomorrow. This is why it is often absolutely meaningless to compare contrast and resolution between different brands. Too many variables come into play – from sensor resolution and AD (analog to digital) conversion, to in-camera sharpening. All these variables will affect produced MTF data. The only exception is when one uses an adapter and mounts lenses from different manufacturers on the same camera body. But even then, lens adapters can create other problems and still potentially affect the precision of measurements. While many manufacturers provide MTF charts for the lenses they manufacture, it turns out that very few actually test lenses. This may sound shocking to you, but it is true. Aside from very few manufacturers like Zeiss, Schneider and Leica, most MTF charts are theoretical that only show the “potential” performance of a lens, not its actual real world performance. That’s because of manufacturing tolerances and variables that can result in differences in lens performance between identical lens models. By now you have probably heard someone say something like “my lens sample is sharp”, which basically points out the fact that there is sample variation. Thanks to modern computerized testing methods and semi or fully automated assembly lines, these tolerances have certainly improved, but they are still there. And if you factor in other potential causes of lens defects, such as shaking / dropping of shipped packages, changes in temperature, etc., you will realize that it is quite natural for lenses to sometimes vary in performance. Given all this, which lens would the manufacturer have to test to provide MTF numbers? The one that shows the best performance, the worst, or an average of multiple tests? This question surely becomes a dilemma, so instead of thinking of all this and trying to come up with a good measure, manufacturers end up picking the “best potential performance”. This means that in order for you to get performance numbers similar to the published MTF, your copy of the lens has to be manufactured perfectly – from each optical element in the lens to every nut and bolt that secures them. And we all know – that just does not happen. Does it mean that simulated MTF data is completely useless and should not be looked at? No, not at all. MTF is still a good reference for looking at the potential performance of a lens and for comparing lenses from the same manufacturer. If there is no MTF data, how would you know that the newer Nikon 50mm f/1.8G performs better wide open than the older and the more expensive Nikon 50mm f/1.4G? You would have to obtain both lenses, assemble a testing lab and then start figuring out the differences, or wait for a trusted resource to do that for you. Obviously, most people do not have the time, patience or deep pockets to thoroughly test lenses, so an MTF chart becomes a good reference. I apologize for such a long article on reading MTF charts. I just felt like the topic had to be expanded to explain things in a little more detail. Please keep in mind that the language of this article is simplified – optics can be quite complex to understand and I simply do not possess such deep knowledge of the subject to go into all the details. Thank you Nasim for a comprehensive article. I have never tried to understand exactly what MTF charts represent, but it’s good to know it and to be aware of the related issues. The length of the article is not a problem since it makes the topic easier to understand. Great article again. Very insightful, once again! Just to expand on your final points (for your readers who may or may not know), DxOMark.com does in fact provide test comparisons of specific lenses on specific bodies for “real world” performance. Thanks for another awesome article. I do, however, like DxOMark’s bench testing for sensors as they test for so many cameras. I never noticed that DxOMark only reported results for lens centers, although they do test on many cameras in addition to the D3X and D800, thus giving the experienced buyer a better idea of a combined sample performance. I do admit I usually result to your blog for lens reviews, as opposed to other sources given how your in depth analysis, technique, and descriptions outdo most! Andrew, I often reference DxOMark in my reviews, because I agree with their sensor testing methodology – I believe it is quite objective and I was able to replicate their findings in my own measurements. As for lenses, I think DxOMark should do an article on how they actually compute their SQF figures, so that we can decide if it is objective enough or not :) From what I have heard so far, there are some issues, which is why I brought them to your attention. Thanks for the insight. I did a bit more research on DxOMark’s testing method, which I find to be quite interesting. After much consideration and thought, it is quite evident that the testing algorithm they use cannot even be compared to the tested and tried MTF chart. Although DxO Labs do take MTF into account, SQF seems to be a combination thereof with the subjective generalization of human perception which will obviously differ from one pair of eyes to another. Thanks for this article, Nasim. While I do not profess to know much about the science behind the field of optics, articles such as this do contribute to one’s overall understanding and create a thirst for additional knowledge, whatever the field. Thanks for creating this thirst….. and please keep the thirst-quenching articles coming. Great article. I appreciate the visual examples and how you explain the differences between different quality levels. I am a strong believer in lens quality making a big difference in the overall quality of a picture. Are the examples all shot AS IS on real lenses? You did say something about the bird shot being exaggerated. Thank you. To get the same picture that makes sense. Keep up the good research. I enjoy learning from you. DItto “great article.” And continued thanks for this great website! Like many other articles in the website, this is a great one. I spent an hour or two to read and understand the article, so I can imagine the amount of time into the research and development of the article. Thank you, Nasim. One thing I would like to ask in the Zeiss Planar F4.0 MTF chart where you mentioned about focus shift, is that mean a hill-shaped convex curve? i.e. Is that the curve a focus shift looks like? Could you please elaborate, thank you. Chris, thank you for your feedback, I really appreciate it! As for the Zeiss f/4 MTF, the curve itself does not usually tell if the lens suffers from focus shift or not. You have to look at the minimum of two MTF charts – one wide open and the other stopped down to identify potential focus shift problems. In the case of Canon MTF, although we have both wide open and stopped down performance in the MTF chart, f/8 is usually too much to determine if there is focus shift – that’s because f/8 hides most of it. Severe cases of focus shift would show, but typical focus shift can only be seen when you look at MTF data at lower f-stop increments. In the case of Zeiss lens MTF example, you can see that the lens starts out well in the center, then sharpness is reduced as you move away from the center. However, when looking at the f/4 MTF, the situation is reversed – now the center shows weaker performance than pretty much the rest of the frame. This is an indication of focus shift. If you were to reacquire focus on the lens at f/4 in the center again, you could get the lens to produce a completely different curve, where the center would be sharp, then the sharpness would deteriorate towards the middle and corners. That’s what spherical aberration does to lenses – focus on one part of the lens and the other goes out of focus and vice versa. Stop it down and focus shifts to another part of the frame. Unfortunately, these types of issues are extremely hard and often impossible to correct! Keep in mind that all lenses suffer from focus shift – some are worse than others. I will read this one often. You are most welcome Francois! Now, this is an in depth article I’ve bee waiting for. All in one place. GREAT JOB!!!! Great article — add one more “thank you” to the list you’ve received so far. Good to finally understand what those MTF charts are in lens reviews. Bill, I need to stop writing articles at 3 AM in the morning :) Looks like I got it mixed up – it should have been in the previous sentence. I fixed the error, thanks for pointing it out! Thanks for a great summary. I printed it and added it to my Two Volume 851 page Thom Hogan D800 “field” manual. Writing clarity needs enough words. I presume you meant Sagittal? spell check nazi signing off! Nasim, you are a very polite & kind person. No need to apologize for such a good article. This article is quite easy to understand. Before I read it, the length of it makes me nervous . That’s why I read a couple of section, then read something else and go back again, until I finish all of it. In the end, I fully understand it. I may need to read it again someday because words like “sagital” and “meridional” is uncommon. Excellent article, Nasim, well written. This site is getting very rich on infos after each post! A very thorough walk through the mysteries of MTF-charts! However I do think the differnt lines and their names could be explained a little further. The sagittal lines are lines coming from the center of the image in an conceivable circle. Sagittal measurements, while most commonly made from the center to one corner, can be made in any part of the image at any distance from the center to all corners as well as to the sides, top and bottom of the image. Meridional (from meridian, the lines dividing the earth from north to south) lines are the straight lines just touching that conceivable circle at 90 degrees to the sagittal lines. They can of course also be measured at any part of the image. As to the names of these lines given here I can as a non native English speaker not comment if these really are the most common used in all English speaking countries. It should however be pointed at that other names are used in other countries. In my ears the names given here, even if they are the correct terms, are both confusing and hard to understand as they are technical words most people don’t understand what they exactly mean. Like sagittal. From the sign sagittarius? Refering to the arrow in the part circleshaped bow? Very far-fetched if you ask me, although it is a plausible visual explanation of these lines. Meridional is if you ask me even misleading as the meridians, while straight on the map, in the 3D world are half circles. In my country the oldest photo magazine (1939-) here in their lens tests use an optical bench and make measurements at 20 lines/mm for a good average between contrast and resolution at wide open and f/8 aperatures. They instead of sagittal use the name radial from radius, which everybody who didn’t skip the math’s lessons know what it is (half of the diameter of a circle). And instead of meridional the term tangential is being used as in tangent in geometry, meaning a straight line touching a curve. In other languages it may be mixed up with the use of sagittal and tangential as names for the lines. Thank you sir! Do you mind if I include the above info in the article? I have been reading mtf explanations for many years including Zeiss’ 2 part from their website. This is the best and most easily understood explanation, a real pleasure to read. The advanced topic of astigmatism and field curvature has been very difficult to find explained at all, let alone well. Thank you, thank you, thank you. This one goes into my optics notebook and I can’t wait to read your other information as this is my first visit to your site. I am no imaging engineer. So Nasim, thanks so much for what I consider the best and most lucidly written explanation of MTF charts. This article has been bookmarked. Thanks for your article. I learn a lot from it! How about the lens test performed by www.imaging-resource.com/artic…-has-moved? Their Blur Index covers all apertures at the most common focal lengths. This is easily the most interesting and informative technical notes and article i’ve ever read on photography. I will definitely come back to this article as reference a duo te-read for a better understand. Really appreciate your time for this lengthy article Nasim. I thought i can interpret those charts before but after reading this article, it came to me that i am not that good at all before. Thanks Nasim, more power! Thanks for the article and can you verify something for me as I’m in a debate over a SLRgear review at the moment. Some fellow photogs looked at SLRgear’s “review” of the newly released Sigma “C” 17-70mm f2.8-4.0 which was tested on a Canon 7d (June 3, 2013). They then looked at the SLRgear’s original “review” of the Canon 15-85mm which was tested on a Canon 20d. NOTE: SLRgears reviews were years apart and were just that, reviews. They weren’t making a direct comparison of the two lenses. Anyhow, some fellow photogs “compared” the two respective MTF test charts to one another and concluded the Sigma lens was “sharper” throughout. I stated this was a bogus comparison because the Sigma lens was tested on a Canon 7d which should contribute to an overall “sharper” image due to advanced processor, possible advanced algorithm and/or software, etc. They however stated the 20d would actually be more likely to contribute to a sharper image (MTF) chart due to it having less megapixels. Less megapixels makes for a sharper looking image because more megapixels reveals more aberations. Therefore, they contend the Sigma 17-70 “C” lens the definitive winner because it’s MTF chart looked sharper then the Canon MTF chart; despite being handicapped by the Canon 7d. Can you please verify one way or another and what is your expertise? Otherwise, is there any documentation to support either? Ralph, I apologize for a late response – just noticed your comment. The only true way to measure lens performance without involving cameras is to do it via an optical bench. But those are very expensive and tough to use. That’s why such tests must be standardized for a single camera. If more than one camera is involved, the numbers should either be normalized (which can be very problematic and prone to all kinds of problems – DXOMark does that), or separate measurements should be done on all cameras. The latter is simply not practical, as it would take a lot of effort on behalf of lens testers. Many thanks for another great review. Finally I understand these! Thank you for your feedback Kumar! Thank you so much for the article. I feel like your website is so much more worthy than a film school with 28000 dollars (CAD) tuition !!! Thank you for your feedback Chris! I do wildlife photography and lately I’m doing wildlife cinematography. My question is about the use of a new lens, the Tamron 150-600mm f/5-6.3, that will be release very soon. I use a RED ONE Cinema Camera and normaly use it with a Sigma 50-500mm, not an amazing lens compared to some primes or other faster zoom lens, but is not expensive, is not heavy and has a good zoom range. We always want more reach and at the same time (in film) we need shots wide, mid and close to tell a story. With the Tamron 150-600mm, will lose some wide shots, but will have more 100mm at the end zoom range with the same f/6.3 aperture, normally we film more close and mide shots and lees wide shots. Frommy interpretation and based on the excelente article you wrote about MTF charts, I think the Tamron lens will have a great contrast at end zoom range, and sharpness/detail on the center, but I don´t know about sharpness/detail out the cornes, cause the sagittal and meridional lines at 30Lp/mm are not close to each other..
Can you please tell me with your experience and looking at the MTF chart of the Tamron lens if it will be at least as good as Sigma 50-500mm(Non OS), I’m interested particulary at the end zoom range, cause mainly will be used ant end zoom range. A comment about MTF charts and vignetting. You can see the effect of vignetting on charts; vignetting improves optical performance similar to stopping down. But unlike the usual stopping down, vignetting mostly affects meridional rays. That’s also why out-of-focus points are circular only at center and “cat-eye” shaped towards borders if vignetting is present. So vignetting can also be responsible for variation between sagittal and meridional curves. The new AF-S Nikkor 58/1.4 has very little variation there which indicates low vignetting and that out-of-focus points will be nicely circular on a very large part of the frame – that can be considered an element of good “bokeh”. Another excellent article! I discovered your site by accident, but you gave me the opportunity to learn a lot. Thanks Nasim for a well-written article on a hard to comprehend aspect of lens quality measurements. You have explained it in a layman’s manner that’s easily understood. I’ve bookmarked your page and will share it on FB. I truly appreciate that you share your knowledge on photography generously with everyone. Great article Nasim, I finally have a better understanding on how to interpret the MTF. Thanks a lot for sharing your knowledge ! Thank you Nasim for the excellent article. I don’t think there is anything as well written on this subject as your article anywhere on the net. WOW, What an informative article, loved it!! I very much want to thank you for this informative article!! I certainly appreciate your care and effort in teaching photography to us the readers!! You are to be commended!! Thanks a lot for putting your time into this article! Great help on considering different lenses! Awesome!! article. Thanks a lot Nasim for enlightening us. Thanks – found it the most informative and easy to understand guide on MTF I could fine. Thank you so much Nasim..this article very useful for me to study about MTF..
Just use the lens in real life and decide if you like it! Thanks for taking the time to do this though! This article is spectacular! Seriously. I cannot thank you enough. Readable, concise, and essential insights that are not easy to deliver, with useful visuals. QUESTION: Why do FF lenses measure worse at DXOmark on APSC bodies than they measure on FF bodies — when in fact the APSC body is only using the stronger center portion of the FF lens? (Even after adjusting for differences in MP on the FF vs APSC sensor). e.g. why is a Sony 55mm f/1.8 a superlative performer on FF but simply above the pack on APSC? For example, when DXOmark measures “perceptual megapixels” on a given full frame lens, there is usually a dramatic difference between measuring on a full frame body and an APSC body. I would have expected any given lens to perform better on the APSC sensor vs the FF sensor because the weaker portions of the frame are carved away leaving only the stronger center. But full frame lenses routinely measure much worse on DXOmark’s tests in APSC and much better in FF, even as a percentage of the total MP on a given sensor. So a for example lens DXOmark might show 50% of p-mpix on APSC (e.g. 12p-mpix out of 24mp) whereas it might show 66% on FF (24p-mpix out of 36mp). This is the opposite of what I would expect given that the APSC uses the stronger portion of the lens, and your MPS charts above illustrate that. Same thing with the field “sharpness” measure where they show you full screen at different FL/Aperture combinations and you can see which portions of the screen are sharp or not (green, yellow, or red). A FF lens will perform better across the board, even in the center, on a FF sensor vs. on a crop sensor. Why would the center of the lens not always reveal the same percentage of megapixels regardless of sensor size? I have read several of your articles and they all carry the same quality. You have a way of presenting very complicated subjects in a way that can be easily understood. Thank you for this article which explains the intricacies of MTF charts and their limitations. I now understand why people argue about the sharpness of the same lens from the same manufacturer! Maybe real life events like using different bodies, manufacturing tolerances and handling etc. If we cannot compare MTF charts of different manufacturers then how do we decide whether to buy a Nikon/Canon lens or a Carl Zeiss/ Leica for our Nikon/Canon body? This article was really very useful to understand MTF charts, thanks for a good article. 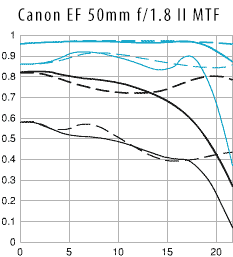 I was reviewing the new Nikon 300mm f/4E PF ED VR MTF chart and found that the contrast & resolution looks very impressive but the only thing i am concerned about is the blue resolution dotted line dipping down drastically, is this really bad or still ok? will it be possible for you to comment on this? i was planning to buy this lens. Thank you very much for your great article. It helped me a lot to step into that topic. Like the old saying: Give a man a fish, you feed him for a day; teach a man to fish, you feed him for life. Now I am not dependent on specific lens recommendations – now I can try to come to get my own view on some lenses. Well done on your demonstration that “Bead1ng is baid”. Very clever. For such a low contrast piece of text it shows clearly that preconceiving and fooling oneself can be easy. This is fantastic. Thank you so much. 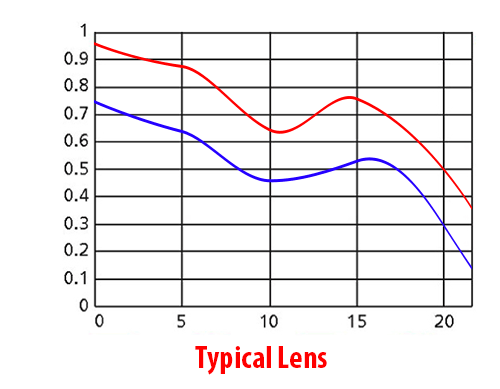 The newer MTF curves in the Lens Rentals blog show a left and a right chart (-20 to +20mm). In the lens sell list the MTF curves show a rotational averaged chart. Could you please comment these in this excellent documentation? Finally I understand MTF charts!. Thank you very much. Of course now I have to continue studying because I am used to dxomark style and now I am not sure which method is more realistic to compare lens. Thank you very much for such an excellent article. I have previously read other attempts to explain MTF data, however this one seemed to be better than those others! I’d also like to thank you for a very informative article. When it says “strong in the center”, are you referring to the center of the frame? And if so, what does it then mean when it says “gradually falls towards the middle of the frame” and “picks up a little between middle and corners”? I’m guessing I just missed something, but any help on this would be appreciated! Nasim, Can you explain what 30 lines/mm means? Where are these lines, on the focal plane or the test chart? I’m guessing you’d adjust the distance of the lens to the chart so that there are 30lines/mm on the focal plane? Could you help with the maths to do that with a 50mm lens? I have this question too. 30 l/mm can be considered detail on a full frame sensor, but since a four thirds sensor is only half the size, don’t we need 60 l/mm values for (micro) four third lenses? A 16 mp ft sensor has a horizontal resolution of 120 line pairs/mm. thank you very much Nasim for explaining so well the mtf.its great.thanks alot again. Nasim, great article! I learned a lot. Thanks for taking the effort to explain. Thank you very much for the article, this is the best article about MTFs out there by far. However, there is something that keeps bugging my mind. For example, the 16-80 is sharper on the sides wide open (f3.3, I was testing this at 35mm) than the 18-55 in the centre at f8. Not only that but the blacks in the 18-55 lens look kind of greyish, not like the very deep 16-80 blacks. Again this is not a surprise at as the 16-80 is 5 times more expensive, but according to the MTF that should not happen. What accounts for that difference in your opinion? Wow! Thorough and fantastic. As you stated, it would be great if all lens manufacturers had one standard, but then I’m sure they don’t for obvious reasons. I did not know what MTF Charts meant or how to interpret them. Thank you for writing this article that helps me understand what MTF charts are about, what they can indicate, and what they will not show. Indirectly, your article confirmed why I loved my Zeiss lenses from my beginnings in 1968 through my years with Rolleiflex and Contax. Around 2008, I switched to Canon, and around 2014, I switched to Fujifilm for much lighter equipment. Hello. this is a great article. I have translated it into Turkish and published on www.hasanoguz.com/mtf-t…il-okunur/ with citation. Thank you very much. Hasan, you never asked for permission to use my articles and translate them to Turkish, so I want you to REMOVE all articles that you took from this website! If you do not do that, I will need to place a DMCA takedown request in Google and they will de-index your site and heavily penalize it. Five years and you still haven’t fixed the misspelling of “meridional”? Thanks for this excellent article on a difficult technical subject much needed to make more informed lens purchasing decisions. Is it ok to ask you for a comparison between Olympus 150-300mm and the new 300 mm lens? If not, thanks anyway. I must have said 75-300mm and not 150-300mm. Thanks! Than you very much. While I knew a little about the MTF charts, your excellent write up on it made me know much more about it. I have bookmarked your page for future reference and sharing with my caring friends..
Great article. I am a physics person that believes in graphs and figures. This article cleared all my doubts regarding MTF data. Thanks a lot for providing such a detailed information. Very good article. Thanks for the time invested. Many thanks for such an educational description of MTF curves. I can now properly “interpret” these graphs on manufacturers’ websites for lenses.